​For a memorable day out visit Fort Rinella, home to the world's largest muzzle-loading cannon ever to be built! Step back into the past and re-live the glory of the Victorian age! ​Visit the Saluting Battery - Valletta's ancient ceremonial platform from where gun salutes are still fired. The passage of time is marked twice daily from here with gunfire at noon (12.00 hrs) and afternoon (16.00 hrs). Visit Malta's best kept WW2 secret. Explore this ultra-secret network of underground tunnels and chambers which originally housed Britain's War H.Q in Malta. View the museum's vast collection of original footage and artifacts including the first George Medal awarded to a Maltese dockyard worker. Explore an extensive underground labyrinth of tunnels and chambers which served as an air raid shelter during WW2. 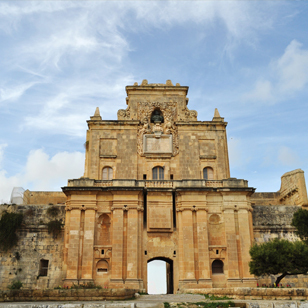 Visit Malta's best surviving baroque gate house. Experience 300 years of continued military development of the Cottonera Lines. Learn about Malta's role as the 'Nurse of the Mediterranean' in the First World War. Relax in one of the prettiest architectural gems in Malta. By the end of the Abyssinian Crisis in 1936, the British military authorities had already adopted a defence scheme for Malta in which three successive lines of defence consisting of some 280 concrete defence posts were to be built. These lines were to be known as the beach, depth and reserve defence lines respectively. The Beach Line followed most of the N.E. – S.E. coast, some 60 miles of ideal landing beaches. The Depth Line ran at the back of the latter with the aim of supporting it in case of being breached. Another defence line, called the Reserve Line ran at the back of the Depth Line. This was formed from 34 posts positioned on high ground and organised in small stop lines consisting of a few posts each. Posts were distanced at 500 yards from each other to provide interlocking fire by which they could defend any of the flanking posts. The aim of the Reserve Line was that of supporting the Depth Line and also to serve as the main point to which the defenders would retire in case of being pushed back by the enemy. The R15 Reserve Post at T’Alla w Ommhu, San Pawl tat-Targa, limits of Naxxar was one such post. It formed part of a stop line positioned between the strategic roads of San Guzepp tat-Targa (Mosta) and San Pawl tat-Targa (Naxxar), these being the main thoroughfares that linked the North with the South of the island at the time. Since ancient times, the Mediterranean Sea had been prone to all forms of sea-borne piratical activity. By the 16th century, this infamous trade had become a crucial component in the all-out war between the Cross and the Crescent. Large numbers of rapacious pirates were licenced as ‘privateers’ or ‘corsairs’ by the warring sides and encouraged to attack and harass the navigation and coastal communities of their opponent. Malta, a small and barren Christian island in the middle of the Mediterranean located a mere 100 miles away from Djerba in Tunis and Tripoli in Libya, two of the most important three Muslim Ottoman bases in the region with half of its coastline on the south-east made from coves and ideal landing places was exposed to such activities. Indeed, for many years the start of the seagoing season instilled a huge fear in the islanders particularly those living in unprotected rural areas close to the sea who always ran the risk of seeing their property and livestock ransacked and stolen by the pirates if not themselves being whisked off into slavery. With the advent of the Order of St. John in Malta in 1530, security against such attacks somewhat improved. For the Order itself practiced the ‘corso’ with its own famous and glorious galley fleet which it justified as being nothing but an extension of its struggle against the Infidel. The Order went on to fortify the main harbour region of the island with expensive fortification schemes which made assault against them almost impossible. Yet, till the early 1600s most of the south-eastern coast and the island’s extremities along with the smaller island remained unprotected. Till then, scattered coastal watch posts were maintained mainly by the militia to sight off any impending attack. Theoretically, these would raise the alarm in time for the rural population to seek refuge in the walled towns. But this did not always work out as planned. A case in point was the great attack of 1614, when a large Turkish force led by Khalil Pasha and consisting of some sixty vessels put ashore 5,000 men in the then still unguarded St. Thomas Bay after being impeded from doing so in Marsaxlokk following fierce resistance from the then newly built Fort St. Lucian (1610). During this attack, the Turks ravaged various villages and penetrated deep into the island’s hinterland till they were forced to withdraw by a strong militia force led by members of the Order. The Order had long been aware of the openness of its southern harbours to pirate attack so much so that in 1610 they built a massive stone fort roughly in the middle of Marsaxlokk bay. The new tower was named after St. Lucian a Christian martyr, called the "Apostle of Beauvais." He was killed in the 3rd century during the Diocletian persecution. In 1614, the then Grand Master Alof de Wignacourt sought to eliminate the inherent dangers of unopposed landings at both M’Scala and St. Thomas Bay by building yet another powerful fort on a spur of land between the two bays. The new work was named after St. Thomas and followed the design of the new forts built to protect St. Paul’s Bay and Marsaxlokk. Is-Simblija is a medieval holding composed of a number of partly hewn caves, a number of man made structures including a chapel, and a variety of irrigation systems. The restoration was funded through the ARAMIS project (Arab Mills and Irrigation Systems in the Mediterranean Basin), which is part of the Raphael programme of the European Union. Work was undertaken by the Works Department and on completion the site was passed on to FWA, which is now responsible for its maintenance. FWA volunteer Joseph Magro Conti played an important role in this project along with Professors Mario Buhagiar, Alain Blondy and Paul Saliba, archaeologist within the Restoration Unit in the Works Division. In the sixteenth century the tenement at Simblija was a viridarium in the possession of the physician and popular hero Joseph Callus who in 1561 was convicted of high treason and condemned to death. As a result this property was confiscated and came to form part of the Grand Master’s estates. It was administered by the Veneranda Assemblea of Conventual Chaplains, hence the name “tas-Simblija” which could very well be a corruption of the original term. The site contains a number of natural caves in which farmers would have lived and a chapel dedicated to St.Nicholas (desecrated in 1575 by the Apostolic delegate Mgr. Duzina). One of the larger caves is known to have served as a centimolo (animal drawn mill). In the vicinity there is a kitchen in a state of ruin. The importance of the site is also connected with early forms of water irrigation. The location of this site has not changed much over the years. It is still an idyllic one with plush greens and peaceful scenery. FWA intends to keep this site as it is although regularly maintained. Located high above Anchor Bay in Mellieha, AB1 (Anchor Bay Post no.1) is a wartime concrete machinegun post built by the British as part of the anti-invasion defences of the island. This post consist of one ground-floor irregular chamber, a rectangular first floor room which also doubles as an observation post and a detached Fighting-light Projector emplacement. This post is secured by its small original armoured door which is perforated with two loopholes. The armament of this post stood at two Vickers medium machineguns along with the personal armament of its seven men section. This post stands on a dangerous part of the dangerously eroded cliff and requires being salvaged and moved inwards. As a result, it is currently unavailable for visiting but can be seen from outside. Please keep a safe distance due to the dangerous state of the cliff. Note: FWA is currently raising funds for this urgent project - you may wish to help by making a donation using the button hereunder.